An excellent place to enjoy a sunset, this small park on the Gulf of Mexico has a large fishing pier with great views of wildlife on the mudflats and on the water. Visitors may encounter overwintering ducks such as Bufflehead, Hooded Merganser and Red-breasted Merganser. Reddish Egret, Snowy Egret, Yellow-crowned Night-Heron and White Ibis occur here also, as well as flyovers of terns and gulls. Shorebirds like American Oystercatcher, Marbled Godwit and Dunlin; in 2013 a Bar-tailed Godwit was found here. Other rarities spotted at the park include Kelp Gull (2011) and Razorbill (2013). In winter, bring your spotting scope and search for Common Loon, Horned Grebe, Bald Eagle, and Roseate Spoonbill. Like many coastal areas in Pasco County, Gray Kingbirds can be found here in summer and Short-tailed Hawks have been spotted in recent years. Launch your kayak and watch for dolphins and manatees as well. The fishing pier is open 24 hours/day. 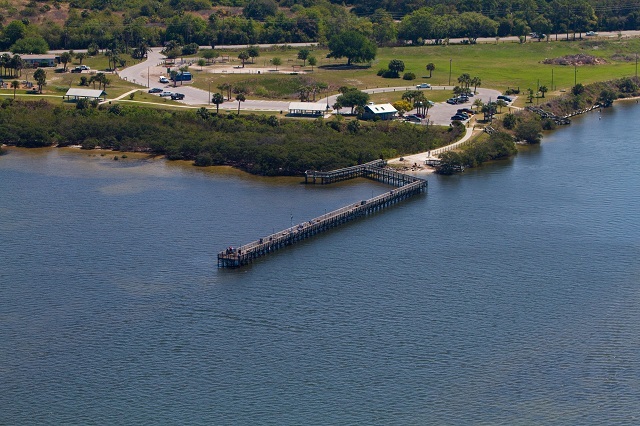 A boardwalk connects to Key Vista Nature Park to the north.